Majestic Saunas are designed to be enjoyed in the comfort and privacy of your home. Our Majestic 2 Person Sauna is easy to install, efficient to operate and maintain and the rich elegant looking cabinet is sure to complement the décor of any room in your home. These infrared saunas are constructed from “A” grade Eco Certified Reforested Canadian Hemlock Wood and feature tongue and grove dual panel cabinetry and our exclusive FAR Infrawave heat technology. This combination of unique materials translates to a quality sauna that retains heat more efficiently, increases cabin temperature faster and requires less energy. The Infrawave Carbon heating panels are 30% larger than saunas heated by ceramic tubes and produce long wave FAR infrared heat. The long infrared waves penetrate 40% deeper into your body and will deliver the health benefits you deserve. 6 Energy efficient carbon heaters produce long wave FAR infrared wavelengths from 5-12 microns, which are the portions of infrared wavelengths most beneficial to the human body. Exclusive Infrawave Heat Technology - Third party tested and proven to emit extremely low levels of EMF. Designed to warm the body directly - not the air. Healthy and Safe! Convenient fingertip Interior and Exterior LED Control pads - easy to adjust settings from inside or outside. CHROMOTHERAPY 8 color health and healing therapy light, promotes relaxation and balance of your Physical and Emotional system. Fresh air ventilation - Adjustable ceiling vent and floor vent holes for added circulation. Electronic oxygen ionizer releases O2 and negative ions, which help purify the air and kill odor causing bacteria in your sauna, keeping the air fresh and clean. Solid wood 2 position towel hooks are a convenient feature to help keep your sauna tidy and organized. Requires standard 120v/15amp power, and the UL approved plug will fit right into your standard home electric outlet. Deep seating – Easily accommodates 2 people on the extra deep bench that runs along the back wall of the sauna. 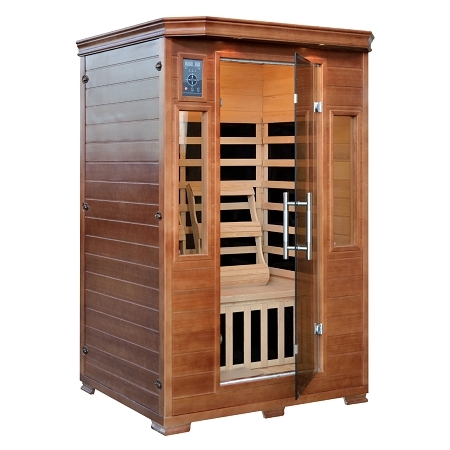 Once assembled the 2 person Luxe sauna measures approximately 49"x39"x75" and weighs 354 lbs.